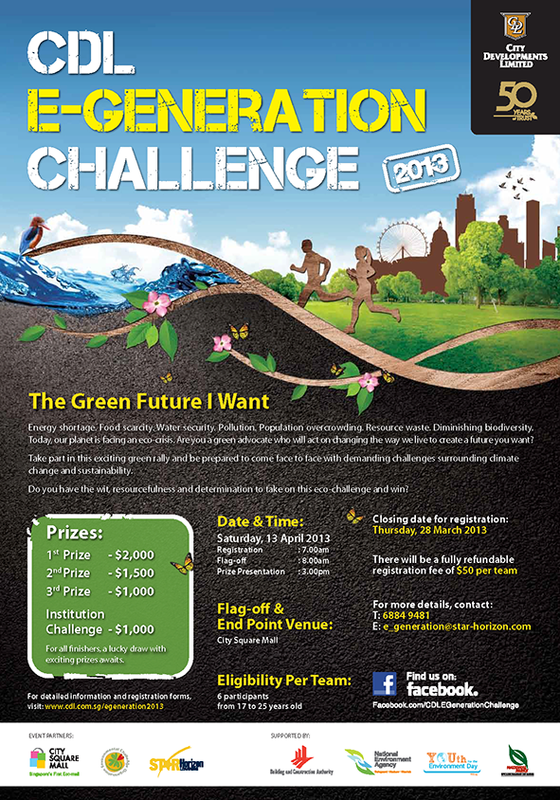 This is an annual eco-themed “Amazing Race” style national competition, which sees teams of 6 participants travelling around Singapore using green modes of transport to complete various eco-challenges in order to reach their final destination. The competition is scheduled for 13th April 2013 and there are cash prizes to be won! · Teams of 6 aged between 17-25 years old. · Team members can be from any institution / course / foreigners / PR / Singaporean. · If all the team members are from ONE school / Institution, they will be able to also compete under the Institution Challenge - 1st team from one institution to finish will win $1000 for the Institution. · Fully refundable registration fee of $50 per team. It will be refunded at the end point on event itself. This is to ensure that teams register and show up.